Police discoveries of marijuana plantations are becoming common in South Africa as hardly a week goes by without police “stumbling upon” them. A recent police bust saw the arrest of teenage growers of the illicit plant. Thursday another huge plantation was discovered. On Thursday (February 10) police in Pretoria discovered a two hectare marijuana plantation in Atteridgeville suburb, a township in the City of Tshwane Metropolitan Municipality, in Pretoria, South Africa, with an estimated street value of about US$690,000. 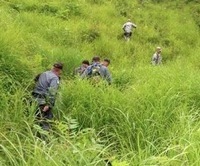 After describing the find to be "[larger than] two rugby fields", local municipality spokesman, William Baloyi, has announced that some 60 officials from the parks division have began cutting down the dagga (local name for marijuana) in the morning and would “probably take the whole day”. William Baloyi who said that the municipality has “never come across such a huge dagga plantation in Tshwane" also said that no arrests had been made. The illicit plantation was in various stages of maturity, ranging from seedlings to fully grown plants. The problem of drugs is fast becoming a bane for South African schools as students increasingly get involved in illicit drug business. Early February, five 14-year-old high school pupils were arrested in Johannesburg for allegedly owning a "dagga" plantation and dealing in the drug. Reports said the boys’ 8 square meter plantation was discovered when a boy reported to the police after smelling dagga in the area. After being questioned, the boy led the police to the plantation where they found the four boys and arrested them. "Some of the dagga plants were already picked-up and dried. More schoolboys might have been involved. "It is suspected that they were smoking it and a possibility that they were also selling it to other school children may not be ruled out” police said. Besides cultivating marijuana for trade, some claim in courts that they use the weed to chase away goblins or to exorcise evil spirits. Effects of smoking are generally felt within a few minutes and peak in 10 to 30 minutes but many first-time users talk of feeling nothing at all. The effects include dry mouth and throat, increased heart rate, impaired co-ordination and balance, delayed reaction time, and diminished short-term memory. Strong doses prompt more intense and often disturbing reactions including paranoia and hallucinations. Most of marijuana’s short-term effects wear off within two or three hours.